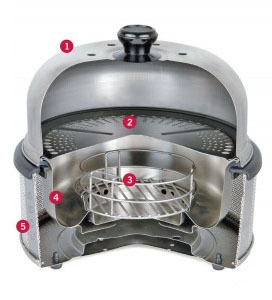 Dome: made with stainless steel and it has a heat-resistant handle. The holes in the Dome ensure even ventilation throughout the cooking process creating an oven effect. Grill Grid: with an easy to clean Teflon® non-stick coating. Excess fat drains away through the holes and into the moat. Fire Basket: A secured area for the Cobble Stone or loose briquettes. Stainless steel moat: catches all excess fat. The moat can also be used for cooking vegetables. Base: with anti-slip rubber feet, the base remains stable and cool to touch during use. Should you have misplaced your instruction manual, click here for an online version.